Reflecting on 2013, I wanted to highlight great things that Alex have done or has happened to Alex. The person that kept coming back to my mind is the one the statue was sculptured for in the photo above. Here is the other Alex in Manchester that everyone knows: Alex Ferguson. He was the manager of the football club Manchester United for 27 years, and announced his retirement on 8 May 2013. 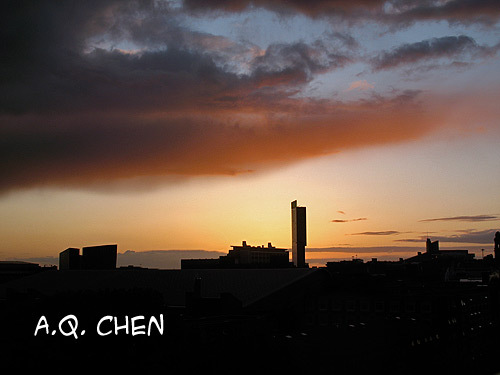 I believe we all should agree that he has done a lot for the local community in Greater Manchester. Great reflection and beautiful shot. Wonderful cloud formations and a great capture/post for the day, Alex!! Hope your new year is off to a great start!! Enjoy!! Wonderful entry. He's very famous guy, right? Happy New Year. Somehow when I click on your link at the Skywatch page, this site uploads empty of posts so I never get to comment, but I'm always clicking your link. Nice reflection, it's very dramatic with the cloudy sky. Such an iconic statue. haven't noticed the reflection before - well spotted. Great shot and a wonderful reflection! That is a terrific picture ! thank for the inspired sharing ! How very special to have one's own sculpture made. Very nice photo. 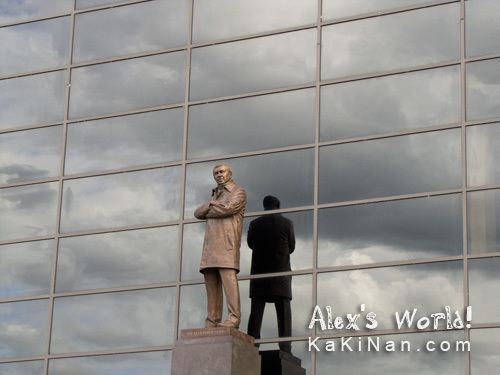 Lovely photo, love how the statue was reflected in the glass. Happy New Year to you, hope 2014 will be better year for everyone.